Access to wireless broadband is an increasingly important part of our day-to-day lives. As we become more dependent on internet access to stay in touch with work and friends via email and messaging apps, the prospect of finding yourself without it can be problematic. Luckily, we stock an extensive choice of wireless adapters that provide a simple solution. Even if your laptop’s already equipped with WiFi, wireless adapters like the TP-Link Archer T2U USB Wireless Adapter can effortlessly upgrade your WiFi performance. Simply plug the adapter into your USB 2.0 connector and make the most of any AC router. With up to 600 Mbps transfer speeds and Windows compatibility, you'll be able to improve the wireless connectivity of a variety of PCs. Impressive data speeds make a wireless adapter like the Archer T2U an ideal upgrade to the built-in wireless card of your laptop, and can result in less buffering and interrupted connections when streaming media. It's compatible with dual band wireless too, so you can connect to either band emitted from your router. Our wireless adapters come in a variety of shapes and sizes, including USB 3.0 compatible models like the Linksys WUSB6300-EJ USB Wireless Adapter. 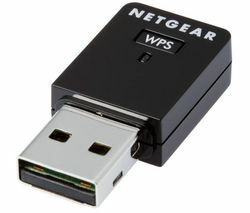 And if you’re looking for a stable Ethernet connection rather than WiFi, check out the UE300 USB 3.0 to Gigabit Ethernet Universal Adapter from TP-Link. Our huge range of computer accessories includes a variety of different adapters. View network adapters or view Bluetooth adapters to browse a range of connectivity enhancing devices.